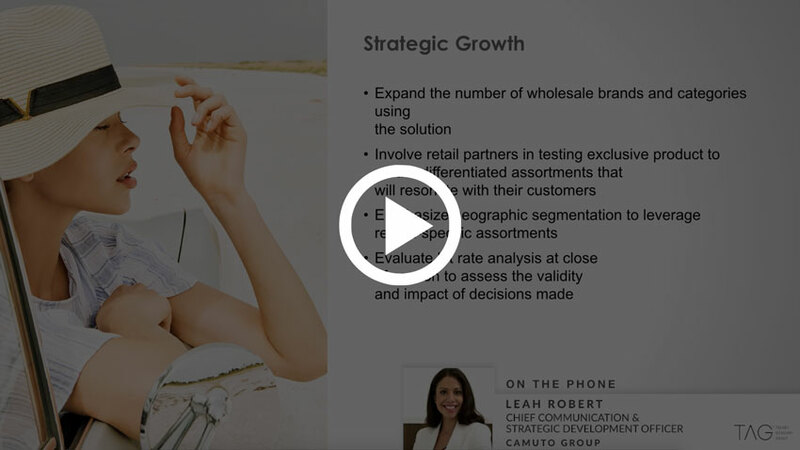 Watch Leah Robert, Chief Communication & Strategic Development Officer for Camuto Group and Greg Petro, CEO of First Insight, as they discuss how the First Insight solution helps Camuto Group bring value to their customers and retail partners. Leah Robert discusses how Camuto Group uses the First Insight solution to identify trends through social listening, which supports a pricing strategy driven by the customers' perceived value of each product. Consumer feedback is a valuable resource for Camuto Group. Leah Robert highlights the benefits of analyzing sentiment data to optimize products pre-market based on input from their shoppers. Leah Robert shows examples of Camuto Group's accuracy in predicting the performance of their winning products using First Insight. This results in higher margins and fewer markdowns for tested products compared to untested items in their assortments. Leah Robert discusses the accuracy of First Insight’s ability to predict actual full-lifecycle AURs and its impact on Camuto Group’s pricing strategies. Leah Robert provides an example of key decisions made based on First Insight results. The success of the product resulted in an expanded buy of the original style as well as a continued investment for the 2018 Spring/Summer season. Not all products are winners. But using the Voice of the Customer, Camuto Group identified a product, which would have initially done poorly in the market, as a potential winner. Leah Robert discusses how a change in the pricing of a product can make it one of the best performers of a season.